We’ve all heard the adage, “No two people are alike,” and from a personal safety perspective this has never been truer. Recent research proves that perceptions of workplace risks vary greatly from employee to employee. Yet our workplace policies are designed to be commonly understood and followed by all regardless of how differently individuals perceive risk. Safety professionals will agree: the tendency to bend safety rules or exhibit risky behavior is unique to each individual worker. In the workplace, it shows day after day in workers who always take proper precautions and also in those who never consistently wear their PPE. How do you communicate with employees who possess varying levels of risk tolerance? Remember, the goal is the same for each individual within the group: to reduce each person’s individual workplace exposures. As a safety professional, you must make sure each worker understands what the hazards are. You train them to properly conduct a job hazard analysis (JHA), and encourage them to frequently refer to the JHA data, which, hopefully, is posted for all to see. Understanding where the risk is coming from is the first step for all, and while some may recognize exposures faster than others, everyone should acknowledge the most dangerous risks around them. Once your workforce recognizes the risks around them, it’s time to take a closer look at the nature of these risks. What is the likelihood that your employees will be exposed to the hazards they have just discovered? What is the severity of these hazards? Here’s where the road divides as individual perceptions related to risk, the genesis of human safety behavior, causes workers to react differently to the identical risks. While your workforce may agree at a high level where the exposures reside, the level of danger they associate them with is dramatically different. Please STOP and reread that last sentence! Have you ever wondered why training a group of individuals using identical safety materials and methods results in such variance in workplace safety behavior? Now you know. Individuals perceive risk differently. Consider this: The graph below shows results from a joint project between NIOSH and the Center for Business & Industry at South Central College in Mankato, MN. It highlights data from 1,200 hourly workers in the construction materials industry in orange, and data from 13 safety professionals in yellow. Both groups were tasked with quantifying likelihood and severity of injury on a five-point scale from a picture depicting a guardrail assembly with a missing mid-rail section. The calculated risk from that data is shown below. 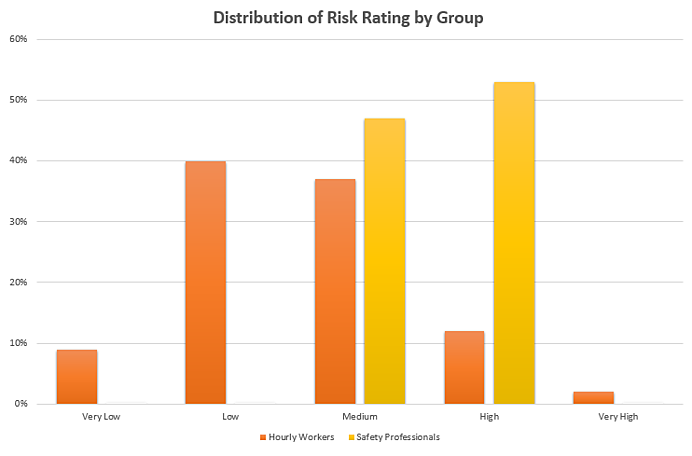 As you can see, the construction workers had much greater variability in their calculated risk ratings, using all five points of the rating scale (1=Very Low to 5=Very High). On the other hand, the safety professionals were in close agreement, rating risk only as “Medium” (3) or “High” (4). Safety perceptions vary greatly among workers – so we cannot assume that everyone will perceive a risk the same way. 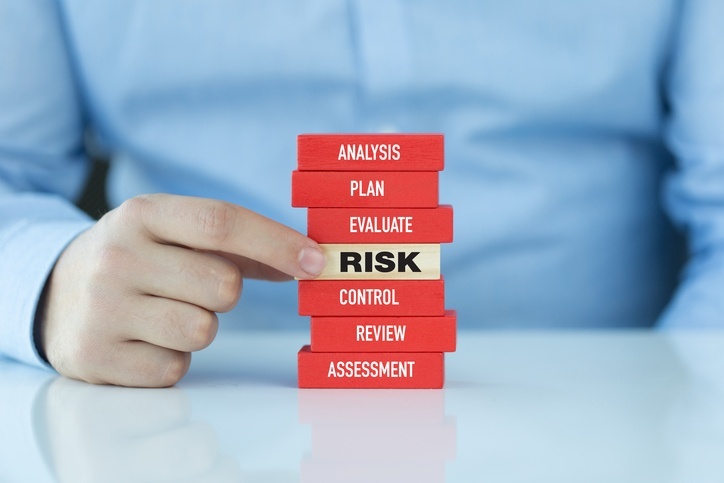 To tackle this, NIOSH hopes that, by teaching employees how to consciously assess risk using likelihood and severity, the range in ratings will become narrower. This research project is ongoing. But, there’s more. Although this approach is encouraging, there are definite limits to risk assessment training. Why? Because individuals tend to exhibit similar behaviors over time unless they can be made aware of how they perceive risks, which we refer to as internal safety. To tackle this, we need use an individualized approach when we train safety. Understanding that each individual exhibits a unique level of innate discomfort with risk that may be higher or lower than the norm, is the key to dealing with the issue of risk tolerance in the long term once hazards and risk assessments are completed. This is why measuring workers’ SafetyDNA, their unique internal safety traits, provides the critical information that they need to understand their personal risk tolerance. It provides them with their natural “starting point,” or default level of risk tolerance. Once you know where your starting point lies, it becomes much easier to learn the necessary steps to adapt your safety behaviors. How does this relate to company rules, policies, and guidelines? You can have the most detailed and comprehensive policies and procedures, but if you have a portion of your workforce psychologically “hard wired” to bend them, no number of handouts, banners, games, or training is going to change their behaviors. To add to this problem, people who are rule breakers by nature view themselves as normal. When they bend or break a safety rule – regardless of the rationale – they actually have conducted their own mini-risk assessment, bypassing company policies. They quickly weigh what they perceive as pros and cons, possibly missing the true risks they will encounter. For this reason, policies and rules on their own have a limited impact on employees’ safety. Change only happens when workers internalize these rules as their own and learn to interpret them based on their own internal safety wiring. The industries I train most in, construction materials and manufacturing, seem to attract people with a natural wiring to bend rules and enjoy the thrill of risk-taking. I have seen over and over again that discovering their own internal safety traits has played a key role in improving personal safety on the job. It’s a self-revealing experience that offers excitement and growth. When workers finally understand their intuitive approach to risk tolerance and rule following, they can consciously, rather than intuitively, improve their behaviors. And, once these folks learn what they need to work on within themselves, positive long-term results follow. We just need to give them a chance to prove it and support them with the right tools and coaching. Personal safety is quite simple when it starts from within. Terry is a Workplace Safety Consultant at South Central College in Minnesota.